Last week, I was invited to discover Santa Elena, a huge region east of Medellin, as part of a blog trip organized by the local business community. I had little knowledge of Santa Elena, nor what there was to do there. The experience turned out to far exceed my expectations, and this post is the first in a series I’ll share over the next few weeks. Viviana and I met the other bloggers and local tourism contacts at Plaza Mayor last Friday afternoon. From there, we took a private van up through the winding roads that lead east out of the valley. The same roads that made me ill to my stomach coming back from San Antonio de Pereira. This time, the nausea didn’t hit me so hard. There are three ways to reach Santa Elena, and this road is the most direct. One can travel from Centro to Santa Elena in as little as 45 minutes by car, which is about the same amount of time it’d take to reach Parque Arvi via the metrocable. After a welcome reception at Mosaico Hotel, which featured a warm fruit cocktail with vodka and raspberry, as well as stuffed, locally-grown mushrooms, the bloggers (and their companions) were shuttled off to different accommodations. In a very smart move, they split us up not just for the night, but most of the weekend. In this respect, we were each on our own individual tour of Santa Elena. Blanca introduced herself to me at the reception. Her and her husband, Gabriel, owned La Montaña Mágica, the 23-year old hotel and spa where we’d be staying. From the reception, it was a short drive, now under cover of darkness, to the hotel. Entering the reception area, I immediately noticed a roaring fire. 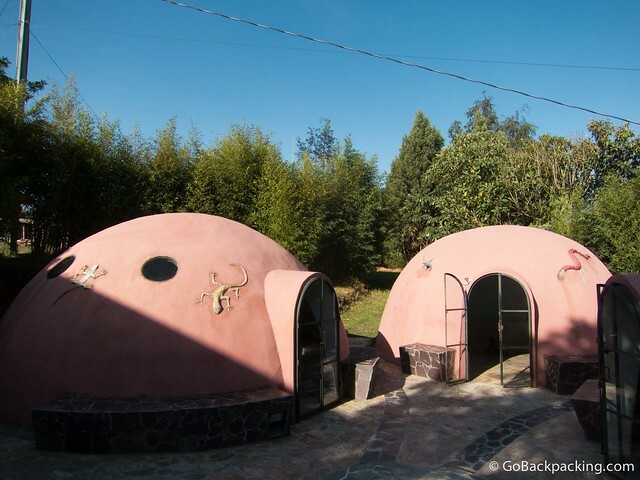 Santa Elena is situated on a plateau 2,600 meters (8,530 feet) above sea level. This is 1,100 meters higher than Medellin, and about the same altitude as Bogota. Once the sun goes down, it gets cold quickly. We were a little behind schedule, so dinner was already waiting for us in the romantically lit dining room. I’ve enjoyed many meals with candles before, but this was the first time they were set on floor candelabras. Throw in the flower petals on the floor, and ambience was hard to beat. The meal began with creamy pumpkin soup, which was followed by chicken breast, served with rice and small salad, and a moist and delicious carrot cake for dessert. Red wine was also served. Before leaving dinner for our room, Blanca warned us about the witches which are known to frequent the area. Belonging to local lore, they are similar to ghosts, and according to Viviana, very real. After dinner, we were shown to our room. I loved the rustic feel to the exposed ceiling beams and brick, as well as the wood decor. It felt as if, and indeed we were, in a mountain cabin. Viviana stepped out onto our small balcony, until I reminded her about the “brujas y serpientes” (witches and snakes) out there. She jumped back into the room without hesitation, asking me not to joke about the witches. The bed was softer than many I’ve slept on in the rural parts of Colombia, but my back wouldn’t have minded if it’d been an even thicker mattress. There were three wool blankets, in addition to the sheets and bedcover, all of which was needed to stay warm at night. Cable TV was also on offer, and while I could see a WiFi signal in the room on my iPhone, I was unable to connect. The WiFi access via the reception and dining area was excellent. The highlight of the room for me was the small wood-burning fireplace. 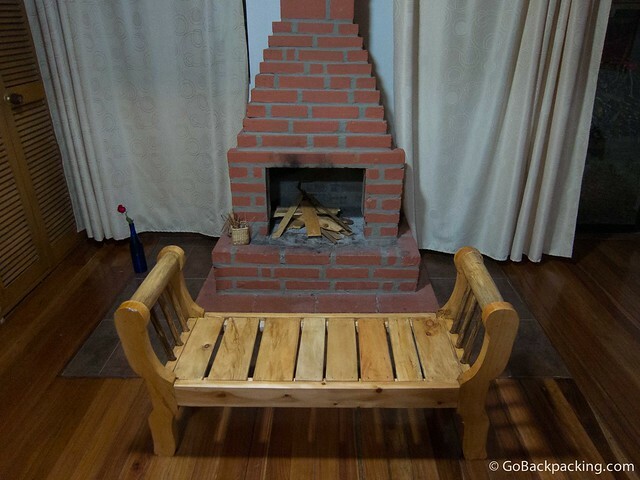 These are a standard feature in all the rooms, and they come stocked with matches, a candle, kindling, and plenty of wood. But there would be no time to start a fire our first night, because Blanca had scheduled us for one of their many spa treatments, which came as a total surprise since it wasn’t mentioned on the itinerary. Upon putting our stuff in the room, we immediately turned around and headed back to the main building, which housed the spa. 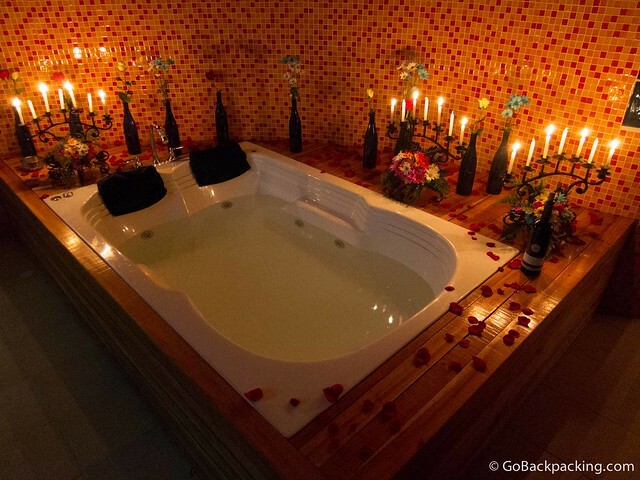 Inside one of the rooms, a candlelit jacuzzi was being filled with hot water. Flower petals were scattered around its edges. I wish I could’ve taken credit for the idea! The masseuse asked if we’d prefer the jacuzzi before or after the massages, and we smartly suggested after, which would allow more time to relax and enjoy the bottle of wine which came with it. The couples massage lasted one hour, and it was a real treat. I’ve had a dozen types of massages in countries around the world, but this was my first in Colombia. I speak for Viviana when I say they both did a good job. A look back at the main building. Most people enjoy breakfast outdoors. Note the row of rocking chairs, perfect for relaxing in the afternoon. The next morning we were up early for breakfast at 8 a.m. It was chilly, but thankfully, there was an endless supply of steamy hot water coming out of the shower head. Walking through reception to the outdoor dining area, we got our first view from the hotel, and it was lovely. A large fire pit was filled with ash from the nightly fires, and several picnic tables welcomed those who preferred to eat out on the grass. The breakfast area featured a buffet of fresh chopped strawberries, mango, papaya, bananas, melon, and apple, along with yogurt and Fruit Loops cereal. 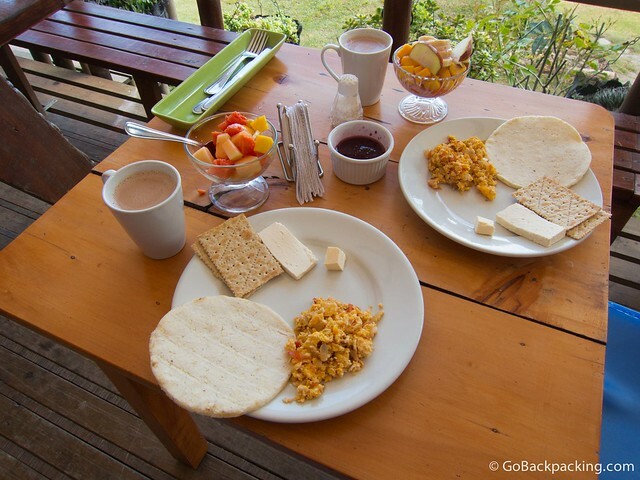 Plus, you can have scrambled eggs either plain, or pericos, which is the typical Colombian style with diced tomatoes and onions. They’re served along with an arepa, cheese, crackers, fresh raspberry marmalade, and either coffee or hot chocolate. It’s a traditional Colombian breakfast, and one I’ve grown accustomed to appreciating over the years. It was impossible not to feel relaxed while enjoying breakfast and the view. There was a total lack of city noise, traffic, and construction, all of which I’ve had to get accustomed to living in Medellin. During our first breakfast, Gabriel, Blanca’s English-speaking husband sat with us for a bit. He said the hotel started small, over 20 years ago. In the beginning, they catered to companies offering their employees relaxing retreats. 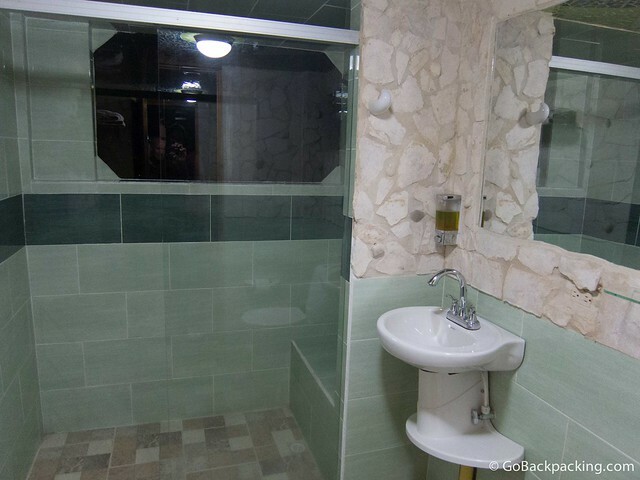 From there, little by little, they built it up, and began servicing regular vacationers too. Given its proximity, most arrive from Medellin, but they also receive guests from other parts of the country. 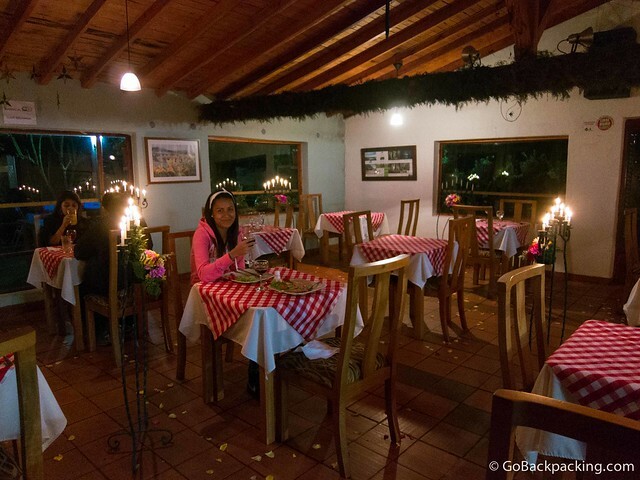 La Montaña Mágica caters primarily to young couples in their 30’s and 40’s. Gabriel relayed that it’s common for couples to celebrate special occasions at the hotel, such as anniversaries. Having experienced the spa the night before, it wasn’t hard to see why. 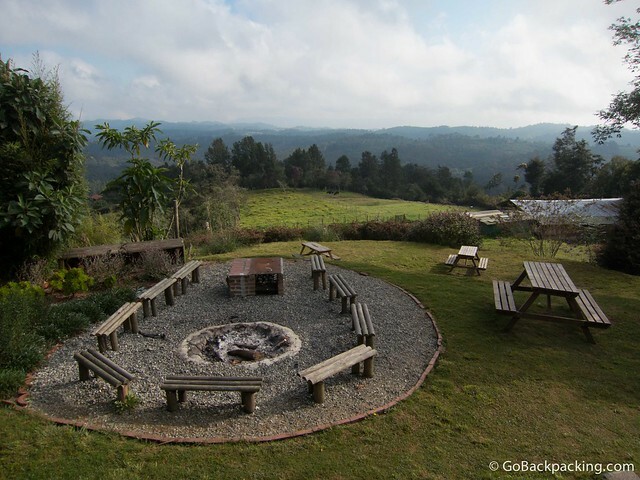 The services and facilities are excellent, the attention to detail is evident, and the location is both peaceful and scenic. In addition to the spa attached to the main building, which is primarily used at night, there is a turco idigena which opens every morning at 9 AM. 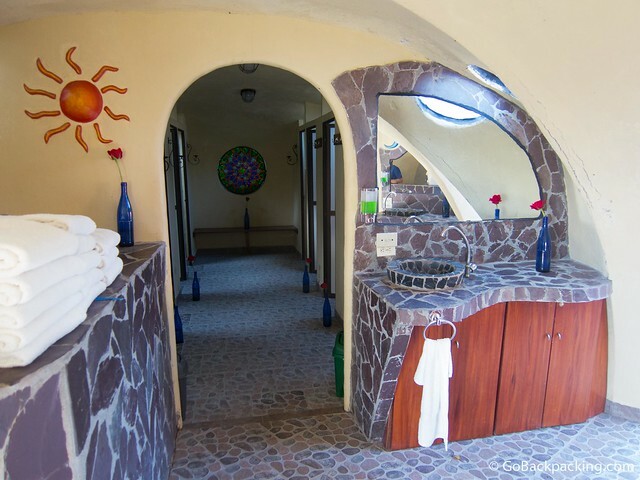 Some of these spaces, decorated in mosaics, can also be used as meditation rooms. We didn’t get to try them out, as both our mornings were otherwise occupied with activities. 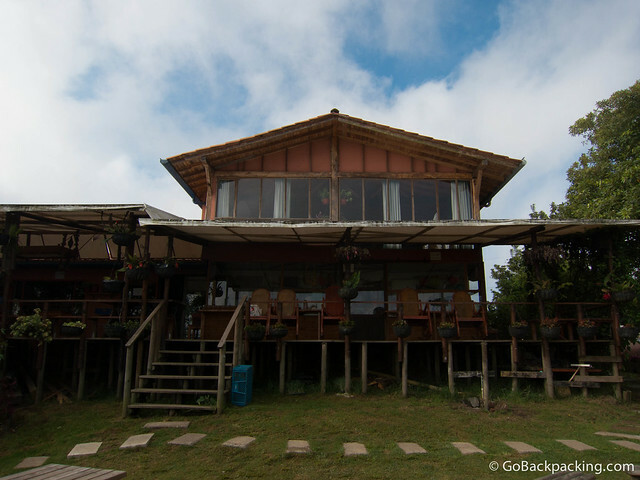 Blanca and Gabriel are warm and welcoming hosts, and they’ve created a unique and relaxing atmosphere, which allows their guests to focus on each other, as well as enjoying a little peace and quiet. 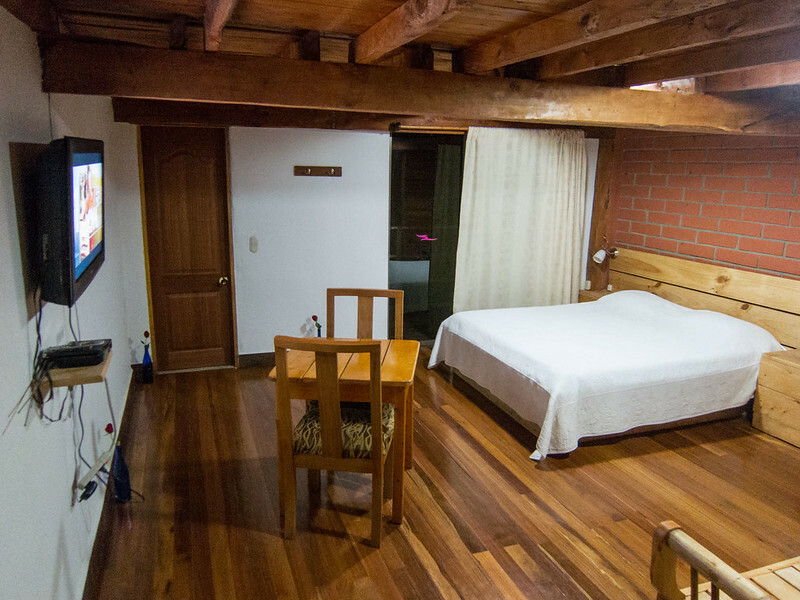 Overall, we had a wonderful stay at La Montaña Mágica, and I’m happy to recommend it for anyone seeking a break from the city life in Medellin. My visit to Santa Elena was at the invitation of Paso Bueno to promote tourism in the region. Here we leave our experience in this beautiful place.